I certify that I may lawfully purchase or possess this air gun in my locale, and that I intend to use this air gun only for lawful purposes. The Ruger® Air Hawk is a 1200 fps pellet rifle with a single-shot cocking mechanism. 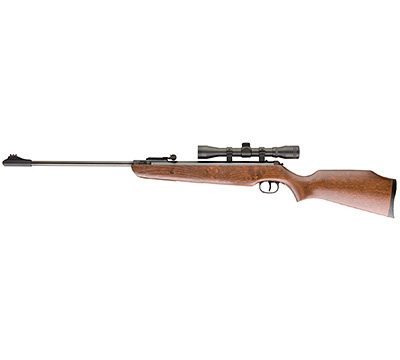 This spring-piston break-barrel airgun has a rifled blued barrel and receiver and is crafted with dark hardwood that is sleekly formed into an ambidextrous stock suitable for both right- and left-hand shooters. The Air Hawk rifle is equipped with fiber optic sights, an adjustable trigger, and a muzzle brake. When you shoulder this Ruger® air rifle, you'll notice a comfortable grip, a conveniently placed automatic safety and a rubber recoil pad. The Ruger® Air Hawk also comes with a 4x32 airgun scope that is made to withstand the double recoil action produced by air rifles. Overall length is 44.80". 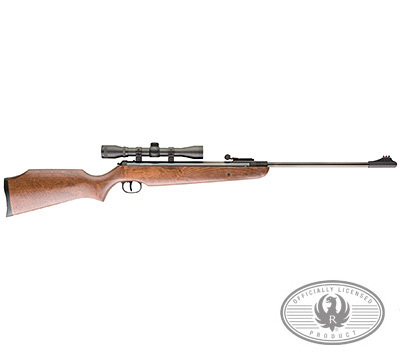 Manufactured by UMAREX under license from Sturm, Ruger & Co., Inc.
AIR GUN PURCHASERS: Air gun purchasers must be at least 18 years of age and be able to legally purchase and own the air gun in the jurisdiction where they reside. Purchasers should be aware that state and local laws may restrict the purchase, possession and use of air guns. STURM, RUGER & COMPANY, INC. SPECIFICALLY DISCLAIMS ANY WARRANTY THAT AIR GUNS IT OFFERS FOR SALE MAY LAWFULLY BE PURCHASED, POSSESSED, OR USED IN ANY PARTICULAR LOCALE. IT IS THE RESPONSIBILITY OF THE PURCHASER TO DETERMINE WHETHER S/HE MAY LEGALLY PURCHASE, POSSESS, OR USE ANY PARTICULAR AIR GUN UNDER THE LAWS OF HIS/HER LOCALE. By submitting an order for an air gun, the purchaser certifies that: s/he is at least 18 years of age; the air gun being ordered may legally be purchased and possessed in purchaser's locale; purchaser intends to use such air gun for lawful purposes; and purchaser assumes all risk associated with the ownership and possession of the air gun. PLEASE NOTE: Due to state and local restrictions and/or document verification requirements, we are unable to accept orders for air guns from certain locations including, but not limited to: California, New Jersey, Rhode Island, New York City, including its five boroughs, Aurora, IL, Chicago, IL, and Philadelphia, PA. We are unable to ship any air gun which accepts pellets with a diameter larger than .18 inches and has a muzzle velocity greater than 700 feet per second to Illinois. This item ships via UPS Ground with Adult Signature Required. Due to shipping restrictions, we are unable to ship airsoft guns to Alaska, Hawaii, and Puerto Rico. This is a a great air gun! The more I shoot it the better it gets. The only downside is the scoop that comes with it. Open the box and just throw it away. I cant believe Ruger would put their name on it! I own seven Rugers. The air hawk rates right up there in quality. Sorry that you didnt like my review ,I guess thats why you didnt include it ?? the gun is cheap made and very inaccurate. First I want to say I own 7 Ruger firearms and all but this one are as good a gun as money can buy. Ive never had a complaint about any of mine until now.The Air Hawk has never put a shot in the same place twice ,with or without the scope.I took the scope off thinking it may be the problem ,but no luck.I have shot just about every brand of pellets I can find and have broken in the barrel with well over 600 shots and still no accuracy at all.I also had the rear sites fiber optic fall out and site wont stay tight either.I can hardly believe it says RUGER on the gun.It now sits in the back of a closet so I dont even have to look at it. Wasted $140.00 of good money on it.Guess someday Ill give it to someone I DONT Like. I received this air rifle as a gift from my Grand Father In Law and it is by far the nicest air rifle i have ever owned or used. I wish it came more quiet , stock. It is a little loud but for right out of the box, its awesome! I sighted in my scope with very little effort and have been running those squirrels out from my home and work. Thank you Ruger for a quality product at a reasonable price. first class product. always on the bulls eye at 50 yard.